The Israeli police arrested Tuesday a Palestinian child from Qalandia refugee camp north of occupied Jerusalem, after carrying out large-scale raid and search campaign throughout the city. Qalandia media center affirmed that the child Osama Hamed was arrested from his house near Qalandia refugee camp and taken to unknown detention center. On the other hand, violent clashes broke out in Shufat refugee camp Tuesday afternoon between local youths and Israeli policemen who violently stormed the camp. Spokesman for Fatah Movement in Shufat camp Thaer Fasfous affirmed that the clashes erupted when Israeli police forces stormed the camp amid heavy fire of teargas bombs and sound grenades at a local school run by UNRWA. Dozens of teargas suffocation cases were reported during the clashes. Along the same line, Israeli forces stormed Issawiya town east of the occupied city and deployed throughout its neighborhoods. Also on Tuesday, Israeli police released two Palestinian youths shortly after their arrest in the nearby Palestinian neighborhood of Jabal al-Mukabbir in connection with an anti-occupation attack that took place in the early morning hours. Israeli media sources said Tuesday morning that two settlers were moderately injured after being attacked by two masked young men who managed to flee the scene. Israeli policemen were deployed in the area, assisted by helicopters, searching for the suspects. Israeli police have carried out almost-daily raid and search campaigns throughout occupied Jerusalem, arresting dozens of youths, women, elderly people, and even children in an attempt to suppress the ongoing Jerusalem Intifada. A Palestinian minor was indicted on Tuesday morning in Israel’s Beer Sheva District Court for allegedly providing assistance in the protection of Hamas-built tunnels in the besieged Gaza Strip, the Israeli army announced after an Israeli authorities-issued gag order was lifted on the case. The Israeli army said the minor, a resident of the Jebalya refugee camp in the northern Gaza Strip, was active in Hamas’ northern Gaza Strip Brigade and carried out military operations on Israeli forces. The statement alleged that most of his training was geared towards "infiltration, entry into buildings, and the detonation of explosive charges as part of a concept that the next combat would be on Israeli territory." He also took part in planting explosives in and around Hamas-built tunnels and stored additional explosives in his home -- allegedly to use in the event Israeli forces entered the tunnels, the statement added. Israeli forces detained the young Palestinian on April 6 after he attempted to cross the security fence into Israel from the blockaded coastal territory. He is allegedly "one of a several militants currently being investigated by the ISA (Israel Securities Authority) and who are revealing updated internal information about Hamas's intensive tunnel digging activity." Israeli security said they acquired “extensive” information on Hamas’ tunnel activities during their investigation, including information on emergency tunnel routes and the location of several tunnel shafts. The identity of the minor and the details of his sentence has yet to be released by the Israeli authorities. An Israeli army spokesperson told Ma'an she expects his identity will be revealed in the next few days. The unidentified minor is the second alleged Hamas operative detained over suspected involvement in the tunnel crossings in the last week, following four consecutive days of Israeli aerial assaults on the besieged enclave. In less than a month, Israeli forces claimed to have uncovered the first two tunnels crossing from the Gaza Strip into Israel since Israel's devastating offensive on the small Palestinian territory in 2014. There have been reports in recent months that Hamas has expanded its tunnel network -- used mainly for military purposes in the northern Gaza Strip and smuggling in the south. Israeli officials have accused Hamas of "preparing" for another war with Israel and have threatened retaliatory measures against the Gaza Strip as a whole. However, despite Hamas' inflammatory rhetoric against Israel, the movement insisted Friday it does not call for a new war with Israel. 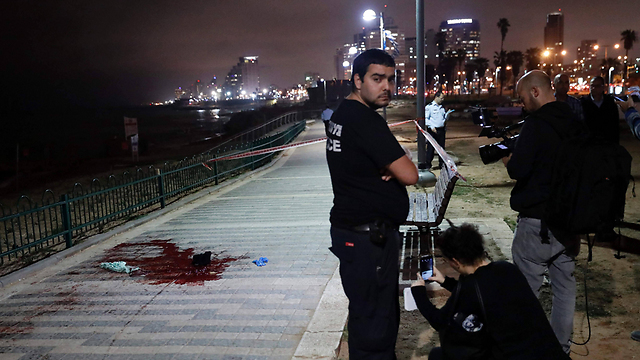 Mohamed Awida drove terrorist Bashar Masalha to Jaffa, where the latter went on a stabbing spree, killing an American and wounding 11 others; harsh charge comes as deterrent to other drivers smuggling illegal workers into Israel. Mohamed Awida, 30, who drove terrorist Bashar Masalha to Jaffa where the latter went on a stabbing spree that ended with the death of American Tyler Force, was charged on Tuesday with negligent homicide and with managing a network transporting illegal workers into Israel. According to the indictment, the Palestinian resident of Jerusalem has been driving illegal workers into Israel once a week for close to a year. For each passenger, Awida received NIS 150-200. Masalha, a resident of Qalqilya, used to ride with Awida once a week. On the day of the attack, Awida transported the terrorist and five other illegal workers into Israel. He dropped the others in the Triangle Area while Masalha was dropped off near the mosque in Jaffa, from where the terrorist began his stabbing spree, stabbing Force to death and wounding 11 others. According to the indictment, Awida was negligent and caused death by "driving hundreds of illegal workers into crowded population centers inside the borders of the State of Israel without having checked or known what tools they were carrying," noting that "he should have expected that a terrorist could be among the hundreds of residents of the territories that he drove into Israel who will commit an attack and cause the death and injury of people." Charging an illegal workers' drive for negligent homicide is unusual, but the State Attorney's Office sought to send a deterring message to drivers of illegal workers that they are responsible for the people they smuggle into Israel. The driver who transported the three terrorists who committed an attack at the Nablus Gate in Jerusalem, killing Border Policewoman Hadar Cohen, was also charged with negligent homicide. The terrorists told the driver they were on their way to work even though they were not dressed accordingly, which should have made him suspicious. The Palestinian prisoner Majdi Yasin suspended his hunger strike after reaching an agreement with the Israeli prosecution to end his interrogation. Family sources affirmed to the PIC reporter that their son has ended his hunger strike that was launched immediately after his arrest on April 26, 2016 at Karama crossing while on his way to Jordan. 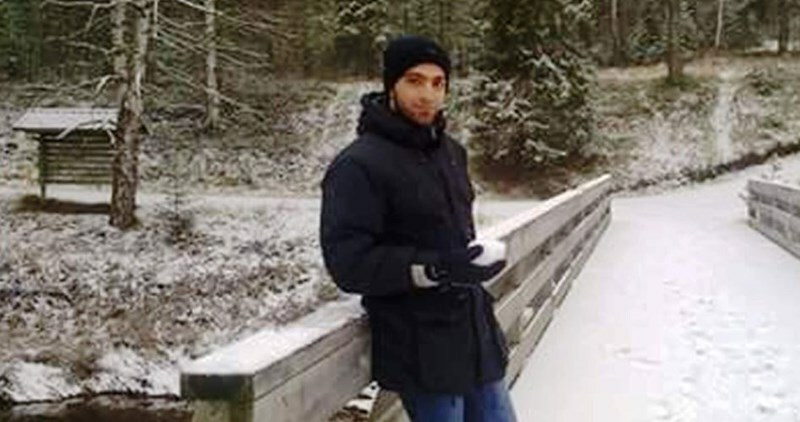 Majdi’s hunger strike was launched in protest against his arbitrary arrest, the family pointed out. The family added that he was arrested while being en route to Jordan to travel from there to Sweden, which he holds its citizenship. For its part, the PA committee for prisoners and Ex-prisoners affirmed that 33-year-old Majdi suspended his hunger strike. According to the reached agreement, Majdi is scheduled to be transferred from Petah Tikva interrogation center to prison and to be brought to court next Tuesday. 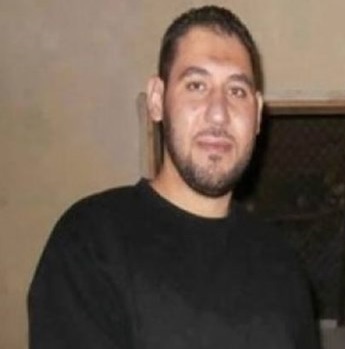 Palestinian prisoner Sami al-Janazra, who has been on hunger strike for more than two months, refused to see visitors from the Red Cross in Soroka hospital after his police guards insisted on not uncuffing his hands and legs. According to the Palestinian Prisoner Society (PPS), the jailers deprived Janazra of his minimum rights by their refusal to let him meet his visitors from the Red Cross without any physical restraints. The PPS lawyer said that the body of the hunger striker became very weak after he lost a lot of his weight as a result of his refusal to take any vitamins or fluids. 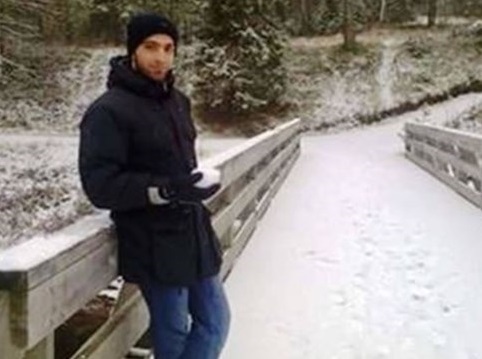 Janazra, from al-Fawwar refugee camp in al-Khalil, was arrested on November 15, 2015 and since then he has been in administrative detention, with no indictment or trial. The Palestinian Prisoners Society (PPS) has reported that Israeli soldiers have kidnapped, overnight and on Tuesday at dawn, at least fourteen Palestinians, including several children, in different parts of the occupied West Bank. 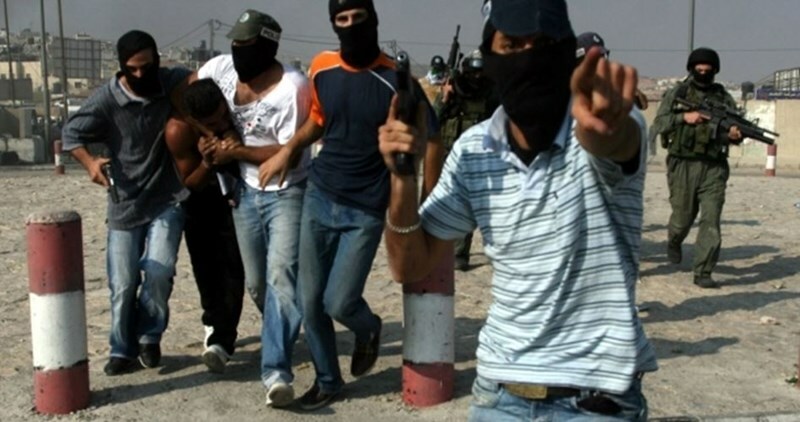 The PPS said the soldiers invaded several communities in the Ramallah and al-Biereh District, in the central West Bank, searched many homes and kidnapped four Palestinians, identified as Cristiano Sam Zahran, 16, Saif Rasem Hussein, 17, Hasan Ahmad Antoush, 16, from Deir Abu Mashal town, and Hazem al-Qawasma, 28. The soldiers also invaded homes in Qotna and al-‘Ezariyya towns, near occupied Jerusalem, and kidnapped Wisam Mohammad Houshiyya, Hasan Mustafa Houshiyya, Mohammad Yousef Shamasna, Mohammad Omar Roumi, 17. In addition, the soldiers kidnapped Ahmad Mazen Abu Khdeir, 14, in Shu’fat neighborhood, Jerusalem. Furthermore, the soldiers kidnapped Bara’ Nawwaf al-‘Amer, 21, from the northern West bank district of Nablus, and Hamza Fathi Qar’awi, 30, from Ein Shams refugee camp, in the northern West Bank district of Tulkarem. The PPS also said that the soldiers kidnapped Mohammad Taher ‘Asayra, 49, from ‘Azzoun town, in the northern West Bank district of Qalqilia, Emad Yousef Sheikh, 16, from Marah Rabah village, in Bethlehem, and Shaher Yahya Abu Jheishe, in the southern West Bank district of Hebron. The Israeli district court in Occupied Jerusalem convicted 14-year-old Ahmed Manasra on Tuesday of attempting to murder Israelis in a settlement last year. Manasra was found guilty by the court of carrying out a stabbing attack on October 12, 2015 in the illegal settlement of Pisgat Zeev in east Jerusalem. Manasra could face a maximum sentence of up to 20 years in prison, according to the kid's lawyers. 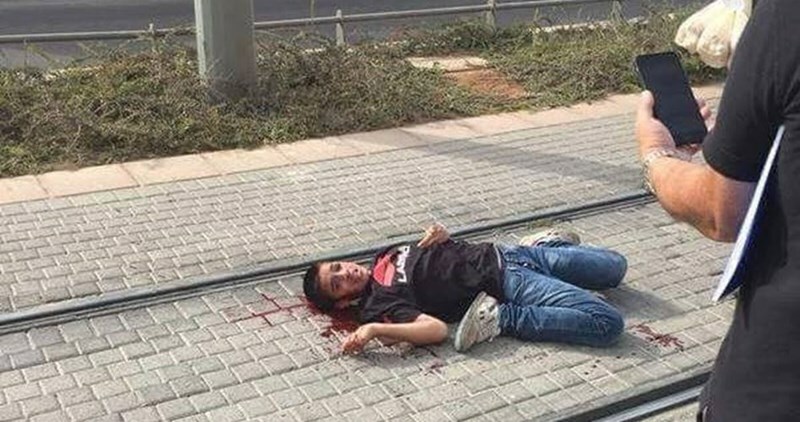 Ahmad, who was 13 at the time of the attack, sustained serious wounds after an Israeli driver hit him with his car following the alleged stabbing. Video footage which went viral showed the Palestinian boy lying in pain on the ground after being hit by the car, while an Israeli bystander cursing him in Arabic with a foreign accent and another tells the police officer to shoot him. Manasra’s cousin, 15-year-old Hasan Manasra, was shot dead at the scene of the attack. His body has since been withheld by Israeli security authorities, although a recent Israeli court ruling ordered his body be handed over to his family. Manasra’s interrogation was also caught on camera. Last November, in a widely shared video release, Israeli police officers appear to be verbally abusing Manasra and intimidating him into confessing to attempting to murder Jews and aiding an enemy at the time of war. According to that video, Manasra was visibly traumatized, crying, hitting his own head, and repeating "I do not remember" before breaking down in tears. The District Court convicted on Tuesday 14-year old Ahmad Saleh Manasra with “two counts of attempted murder and possession of a knife” in reference to carrying out a stabbing attack last October in the settlement of Pisgat Zi’ev. Lawyer Tarek Barghouth from the Ministry of Prisoners explained that the District Court decided to convict the child Manasra with two counts of attempted murder and possession of a knife in the settlement of Pisgat Zi’ev north of Jerusalem when he carried out a stabbing attack along with his 15-year old cousin Martyr Hasan Khaled Manasra which led to the injury of two settlers. Barghouth added that there are contradictions in the conviction of Ahmad Manasra which did not rely on the facts. Barghouth also added that the court scheduled a session on 11/7/2016 for the sentencing of Manasra. On October 12th, 2015 Ahmad and his cousin Hasan went to the settlement of Pisgat Zi’ev near their homes in Beit Hanina after they had left school; Ahmad was in 8th grade. He was arrested while bleeding in the streets of the settlement after being critically injured as he was run-over and assaulted by settlers. He was also verbally assaulted while lying on the ground and was not provided with any kind of treatment despite his urgent need for it. After several days in Hadassah Ein Kerem hospital, he was transferred to an internal institution in “Yarka” in the city of Akko. These institutions are similar to prisons and children arrested for security cases are detained and treated differently from the rest of the detainees. Visits are limited to certain people and the children are not allowed to leave the institution even during holidays. Last month, the duration of detaining Manasra in this institution was extended for three more months. Last November, a video was leaked from the interrogation room where Manasra was being interrogated. The video showed that extent of psychological pressure and intimidation Manasra was subject to during the interrogation in order to extract confessions. The interrogator was yelling and insulting the divine self in order to provoke Manasra. During the interrogation, they showed him videos of him and his cousin Hasan and the interrogation was focused on him confessing to carrying out a stabbing attack against settlers. Ahmad cried a lot during the interrogations and insisted on not remembering anything about the incident; the interrogators continued questioning him for several hours despite crying. The video showed three officers interrogating the child Ahmad Manasra on charges of attempting to carry out a stabbing attack with his cousin Hasan who was shot by the Israeli soldiers and passed away immediately. Israeli soldiers kidnapped, on Tuesday at dawn, two Palestinians in towns near occupied East Jerusalem, and one in a village, south of the West Bank city of Bethlehem. Several Israeli military vehicles invaded Qotna village, northwest of Jerusalem, before the soldiers stormed and ransacked many homes, and kidnapped a young Palestinian man, identified as Mohammad Yousef Shamasna. In addition, the soldiers invaded and searched a number of homes in the al-‘Ezariyya town, southeast of Jerusalem, and kidnapped Mohammad Omar Abu Roomy, 17. In Bethlehem, the soldiers invaded Marah Rabah village, south of the city, searched many homes and interrogated several Palestinians, before kidnapping a young man, identified as Emad Yousef Sheikh. MP Bassem al-Za'arir said that the arrest of Sheikh Salah aims at muting the free voices defending the Aqsa and Occupied Jerusalem and constitutes an attempt to end Jerusalem Intifada. In a press statement on Monday, Za'arir opined that Sheikh Salah, who is a key figure and key component of Jerusalem Intifada, has become a model for the defense of Occupied Jerusalem and the Aqsa Mosque as well as other sacred places. He called for massive support for Occupied Jerusalem and the Aqsa holy site after the arrest of Sheikh Salah, saying that his detention will not weaken the determination of the Palestinian people. 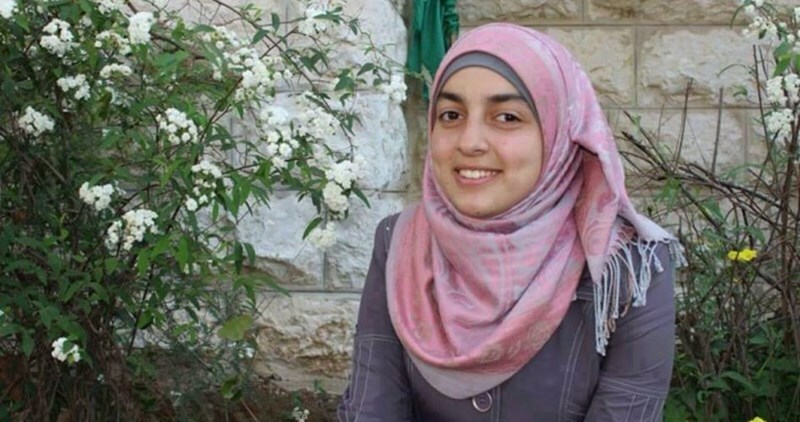 Israeli Occupation Forces (IOF) handed a letter to the 21-year-old Palestinian ex-detainee girl Asma al-Qadah banning her from going to university for five months which threatens her completion of university studies. Islam al-Qadah told Quds Press that Israeli intelligence forces summoned his sister to be interviewed in Ariel settlement and handed her the ban order one month after her release after three months of administrative detention with no charge or trial. Asma al-Qadah is a Bachelor student in the English Department. She serves as the cultural committee secretary at the student union council. She is affiliated with the Islamic bloc, the student wing of Hamas Movement, in Beirzit University. The Palestinian Prisoners Society (PPS) has reported that Israeli soldiers invaded several districts in the occupied West Bank, searched many homes and kidnapped five Palestinians. The PPS said the soldiers kidnapped Bara’ Nawwaf al-‘Amer, after storming his home in Kafr Qalil village, south of the northern West Bank city of Nablus. The kidnapped Palestinian is the son of a journalist, identified as Nawwaf al-‘Amer, and is a law student at the Najah University in Nablus. 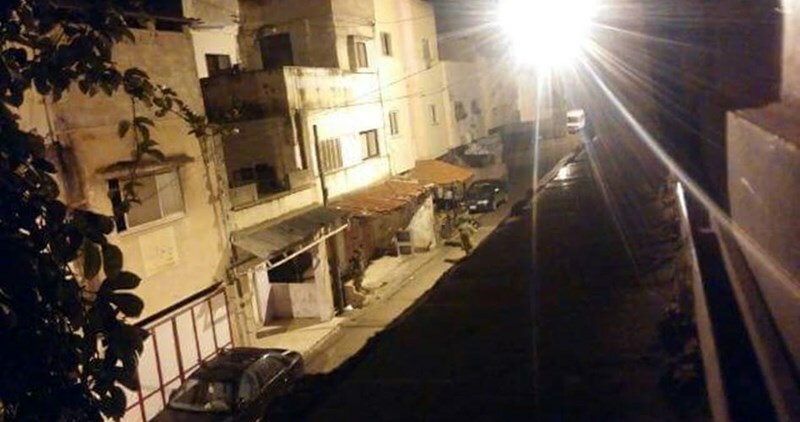 The soldiers also broke into and searched homes in Nour Shams refugee camp, east of the northern West Bank city of Tulkarem, and kidnapped a former political prisoner, identified as Hamza al-Qar’awi. 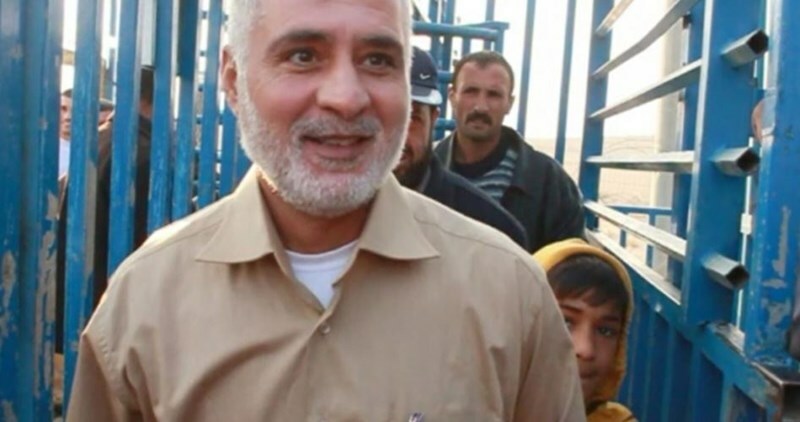 Al-Qar’awi was previously imprisoned by Israel for seven years; he is the son of Legislator Fathi al-Qar’awi. The PPS also stated that the soldiers kidnapped Hazem al-Qawasmi, from his home in Um ash-Sharayet area, in the central West bank city of Ramallah. 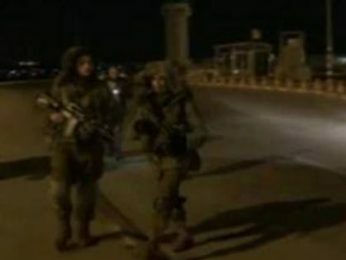 Also on Tuesday at dawn, the soldiers kidnapped three Palestinians; two near occupied Jerusalem, and one near Bethlehem. In addition, the soldiers invaded and searched several homes in Beit Ummar town, north of the southern West Bank city of Hebron, and Za’tara village, east of Bethlehem. The Israeli Occupation Forces (IOF) arrested at dawn Tuesday a university student from Kafer Qalil town south of Nablus to the north of occupied Jerusalem. The Palestinian journalist Nawaf al-Amer told the PIC reporter that Israeli forces stormed and violently searched his house at 2 a.m. before arresting his son. His 20-year-old son Baraa, a student at al-Najah University, was arrested only one day before the final exams, Al-Amer elaborated. Mobile phones, laptops, cameras, and an amount of money were stolen during the Israeli raid into the house, he added. The journalist Nawaf al-Amer is a former political detainee who was jailed last year in PA jails. 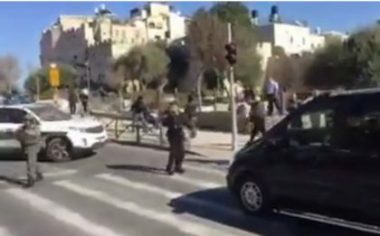 Israeli sources have reported, Tuesday, that two elderly Israeli women were injured in a park, in Jabal al-Mokabber Palestinian town, in occupied Jerusalem, after being stabbed by two masked young men who managed to escape before the soldiers installed many roadblocks and pushed more units. Israeli daily Haaretz said the two women, in their seventies and eighties, were stabbed in Armon Hanatziv colony, and that the two went for a walk, along with three other adults, before being attacked by two masked men. Haaretz added that one of the women was injured in her upper body and extremities, while the other woman was injured in her upper body. The WAFA Palestinian News Agency said a large Israeli military force closed many roads in Jabal al-Mokabber, and took the detained Palestinian to an interrogation center, allegedly for involvement in the stabbing attack in Armon Hanatziv colony, illegally built on Palestinian lands. The Palestinian prisoner Sami Janazra, from Fawar refugee camp in al-Khalil, entered on Monday his 68th day of hunger strike in protest against his administrative detention. Janazra’s family warned of his serious health deterioration as he started suffering frequent fainting and became unable to move or to walk. The family called for activating their son’s issue on local and international forums, appealing for his immediate and unconditional release. 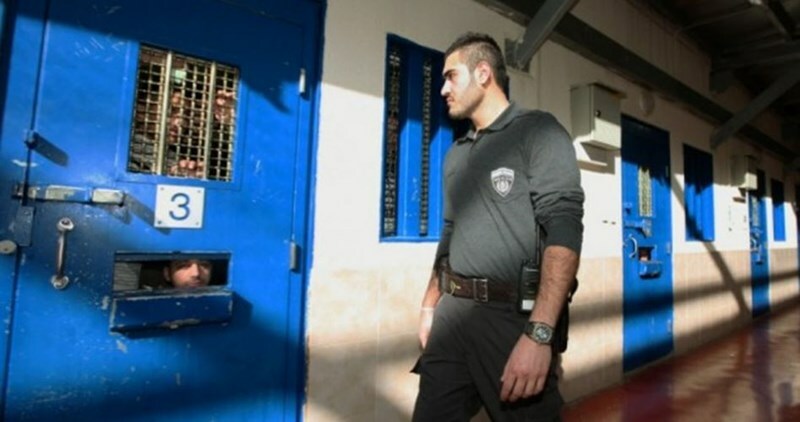 Along the same line, the Palestinian Prisoners Society (PPS) revealed on Monday that the Palestinian prisoner Adib Mafarjeh, who is on hunger strike for 36 days in protest against his administrative detention, started vomiting blood. Mafarjeh, who is currently held in Gilbao prison amid very difficult detention conditions, refused to take water and vitamins or to conduct any medical tests, the PPS underlined. Mafarjeh is being held in a cell that has a dirty and foul smell since his arrest in December 2014, according to the rights group. About 700 Palestinians are held in administrative detention in Israeli jails without charge or trial. The Israeli court in Ofer on Monday sentenced the 22-year-old Palestinian young woman Majd Atwan for 45 days over Facebook comments. Jamil Sa’ada, the lawyer at the Palestinian prisoners and ex-prisoners committee, said that the court also imposed a 3000 shekels fine on Majd, who hails from al-Khader village in southern Bethlehem. Majd, who was arrested on 19/4/2016, was charged with posting comments on her Facebook page that were described as incitement against the occupation. The Palestinian Prisoners Society (PPS) has reported that Israeli soldiers invaded, on Monday at dawn, various districts in the occupied West Bank, searched many homes and kidnapped at least fourteen Palestinians. The PPS said the arrests took place in various Palestinian communities in Nablus, Ramallah, Jerusalem and Bethlehem. The soldiers broke into dozens of homes, and searched them, causing property damage, in addition to interrogating many Palestinians. 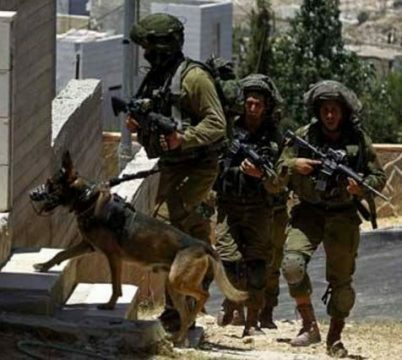 They also conducted military searched in Palestinian lands, around Ya’bad town, near the northern West Bank city of Jenin, after the army said several shots were fired on a military pose, near Mabo Dothan colony. 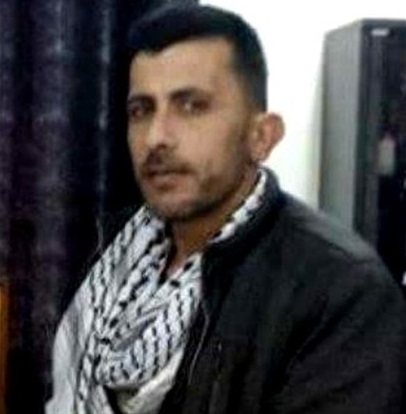 Thabet Nassar, 34, from Madama town, near Nablus. He is a former political prisoner who spent 12 years in Israeli prisons. Abdul-Qader Mer’ey Hanani, from Beit Forik, near Nablus. Alaa’ Assaf, a university student from Birzeit city, west of Ramallah. Firas Mahmoud, from al-‘Eesawiyya town, east of Jerusalem. Mahmoud ‘Ateyya, 17, from al-‘Eesawiyya town, east of Jerusalem. Mohammad Mashahra, from Jabal al-Mokabber in Jerusalem. Rami Mahmoud Odeh, from Qalandia refugee camp, north of Jerusalem. Eyad Ahmad Taqatqa, 20, from Beit Fajjar town, south of Bethlehem. Zeineddin Sayel Issa, 18, from Beit Fajjar town, south of Bethlehem. Qassem Yassin Issa, 18, from al-Khader town, west of Bethlehem. Hussein Issa, 18, from al-Khader town, west of Bethlehem. Ahmad Issa, 18, from al-Khader town, west of Bethlehem. Rabea’ Issa, 18, from al-Khader town, west of Bethlehem. Ali Issa, 18, from al-Khader town, west of Bethlehem. 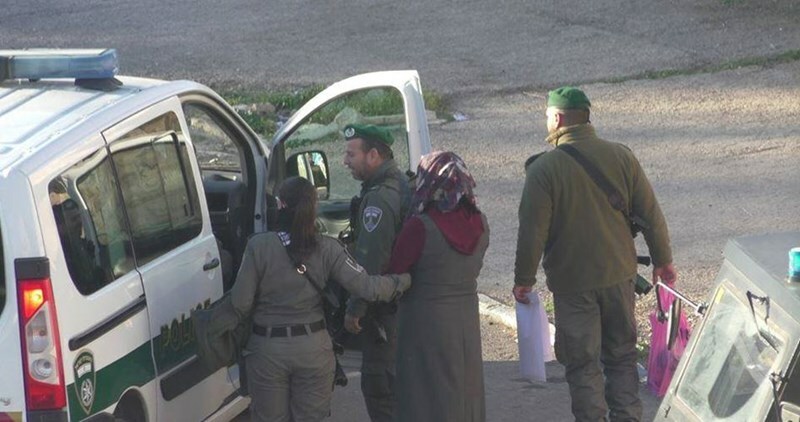 Israeli occupation forces (IOF) detained a Jerusalemite young woman on Monday afternoon for having a knife in her possession. The 0404 Hebrew website said that IOF soldiers at Zaituna roadblock to the east of occupied Jerusalem suspected the lady was planning something after they told her to go away from the road barrier but she returned anew. The site said that the soldiers searched the young woman and found a knife in her possession, adding that she was taken for investigation. 33-year-old lawyer Majdi Yasin has been on hunger strike for 15 days running in protest at his detention with no guilt, according to his family. His family told the Palestinian Information Center (PIC) that Yasin started his hunger strike immediately after his detention by the Israeli security authorities at al-Karama border crossing. The family added that he was en route to Jordan to travel from there to Sweden, which he holds its citizenship. It affirmed that he would not end his hunger strike until he was released and allowed to return to Sweden, pointing out that its son is in jail with no charge. Palestinian prisoners in Ramleh prison’s clinic complained about the management procrastination in transferring them to civil hospitals for conducting medical examinations and operations in addition to medical follow up. The sick detainees told the lawyer of Palestinian Prisoner Society who visited them in jail that some of them are waiting for surgeries, installation of artificial limbs and CT scan. 21 captives are languishing in Ramleh Prison’s clinic including 10 detainees held in the clinic permanently. 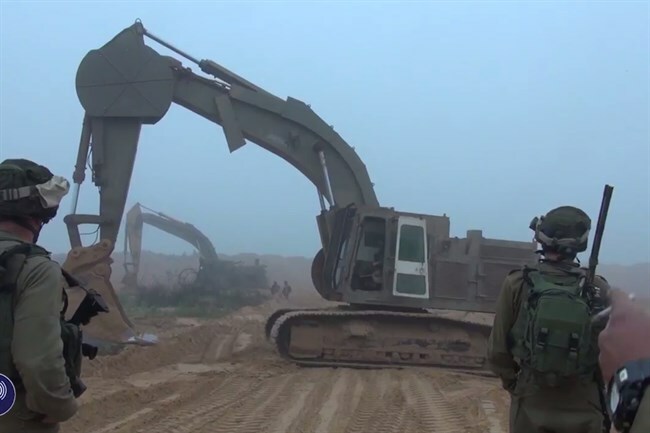 The Israeli Occupation Forces (IOF) were deployed at dawn Monday in large numbers near Yabad and Kfrit towns south of Jenin following an alleged anti-occupation attack on a military checkpoint near Dotan illegal settlement. Local sources affirmed to the PIC reporter that armed elements opened fire at a military checkpoint erected at the entrance to Mabo Dotan settlement, built illegally on Palestinian-owned land in Yabad town. Following the alleged shooting, Israeli forces were deployed in large numbers at the eastern entrance to Yabad and Kfrit towns and carried out combing operations. Along the same line, IOF soldiers brutally attacked a local resident of Silat al-Dahar town south of Jenin, causing him different injuries and bruises. The injured man was stopped at a military checkpoint near Salfit before being violently beaten and left bleeding, eyewitnesses told a PIC reporter. He was then taken to Rafidia hospital in Nablus for treatment. Meanwhile, Israeli forces arrested a young man after violently breaking into and searching his home in Beit Furik town east of Nablus. An activist in the Popular Front for the Liberation of Palestine (PFLP) who spent 12 years in Israeli jails was also arrested from Madama town south of the city. In Ramallah, a university female student was detained from her house, while two citizens were arrested from Deir Abu Mishaal town. Three more arrests including a minor were reported in occupied Jerusalem, while a young man was arrested in Beit Fujar town south of Bethlehem. Along the same line, several homes were stormed and searched in Idna town in Aroub refugee camp. The Israeli occupation police on Sunday evening kidnapped three children in two separate incidents in Occupied Jerusalem. 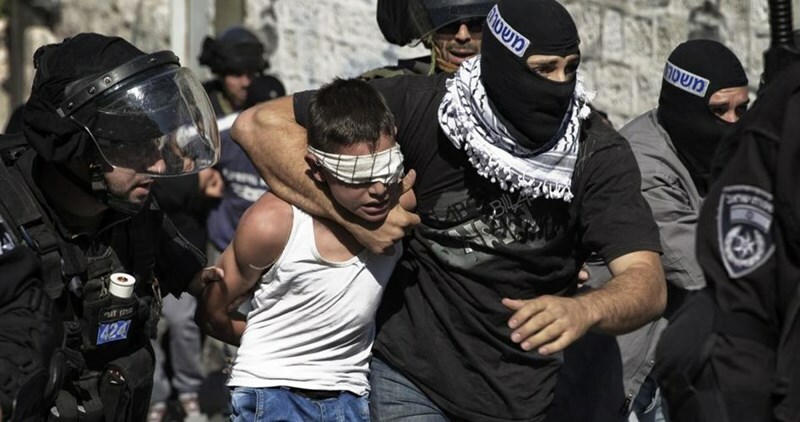 According to the Jerusalem Media Center, plain-clothes policemen kidnapped two children from Salman al-Faresi street in Attur town, east Jerusalem. Israeli police forces also kidnapped on the same day a child called Omar al-Za'anin from his home in the Old City of Jerusalem. In a separate incident, the Israeli police on Sunday summoned 60-year-old Marwan al-Hashlamon for interrogation and informed him of their decision to ban his entry to the Aqsa Mosque for several days. Hashlamon had been arrested many times last month. Another Jerusalemite citizen named Akram al-Sharfa was handed an order extending the ban imposed on his entry to the Aqsa Mosque. Sharfa has not been able to enter the Mosque for two and a half years. 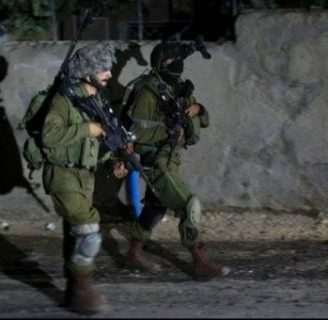 Dozens of Israeli soldiers invaded, on Monday at dawn, the towns of al-Khader and Beit Fajjar, south of the West Bank city of Bethlehem, searched and ransacked many homes, and kidnapped seven Palestinians. The army also broke into several homes in Hebron. One Palestinian was kidnapped near Jenin at night, Sunday. 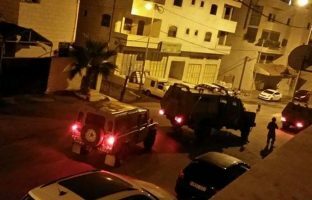 The soldiers surrounded the al-Khader town before invading it, stormed and searched many homes, and interrogated several Palestinians. The soldiers then kidnapped six teenagers, identified as Zeineddin Sayel Issa, 18, Qassem Yassin Issa, 18, Hussein Issa, 18, Ahmad Issa, 18, Rabea’ Issa, 18, and Ali Issa, 18. In addition, the soldiers kidnapped one Palestinian, identified as Eyad Ahmad Taqatqa, 20, from his home in Beit Fajjar. Eyewitnesses said the soldiers invaded the town through its eastern and western parts, and were extensively deployed around the Red Mosque, before storming and searching several homes. In related news, the soldiers stormed and searched many homes in Shiokh al-‘Arroub town, northeast of Hebron, and installed many roadblocks on main roads leading to Sa’ir and Halhoul towns, in addition to Hebron’s northern entrance. The soldiers stopped many cars and searched them, and investigated the ID cards of dozens of Palestinians, while questioning many of them. 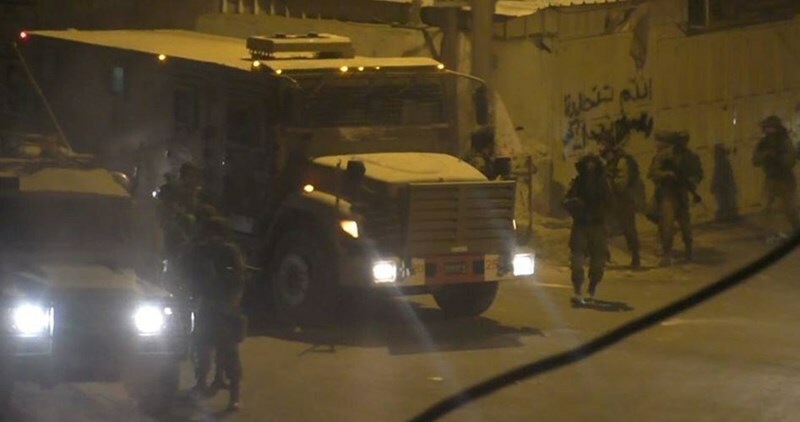 Furthermore, the Palestinian Prisoners’ Society (PPS) said that the soldiers kidnapped a Palestinian, identified as Raed Mahmoud Mer’ey, 22, from Sielet al-Harethiyya town, west of the northern West Bank city of Jenin, after stopping him at a roadblock, southwest of the village. The soldiers also stopped and searched dozens of cars, and interrogated many Palestinians while examining the ID cards.